I took a look at a memoir that Vickie Vertiz recommended to me. 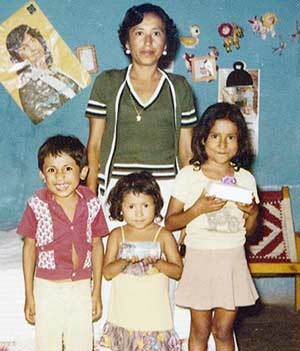 “It’s about who gets left behind in that trip from Mexico to the US,” I remember her saying. I always feel a bit anxious reading work about Mexico. I don’t speak Spanish, and I am not originally from the West Coast. From the vantage of Manhattan, Puerto Rico was my nearest Spanish-speaking cultural and geographical point. Although I have lived in California for many years, I still feel uncertain navigating the area’s complex colonial and postcolonial history. In deceptively simple language, Grande takes us through a number of journeys and many many separations. The adults in her world are continually leaving Mexico for that mythical US space known as el otro lado, while those left behind are powerless to control their fate because they are children. The focus of the narrative is Grande herself and her two siblings, who are left by first by their father and then their mother, as they are shuttled between relatives’ houses — each one of them an overcrowded space where poor people dwell. The first section of the memoir has a fairy-tale like quality to it, and at times I couldn’t decide who I hated more: the absent dad, the nomadic mom, the “wicked” grandmother, or a host of other problematic relatives and friends. But one can’t hate them for long, because it’s clear that each person is so burdened by poverty, fear, and the desires that every person has for love, comfort, fulfillment etc, that they are operating on a level of desperation that is absurdly high. Yet Grande makes that desperation at once normal, familiar, and completely understandable. These are not pitiable people, by the way. These are people filled with energy and enthusiasm and anger and conflicting loyalties and the will to live. 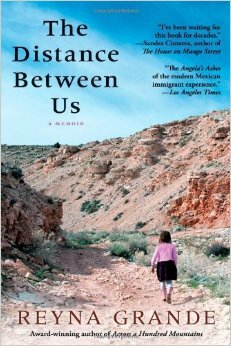 In the second part of the memoir the kids actually arrive on the other side of the US/Mexican border and we see struggles of a different kind. At this point we begin to grasp what Grande and her siblings have lost in leaving behind the dirt floor of the bamboo shack they inhabited with the “good” grandmother. They have left behind alot: community, a sense of belonging, and language, as well as food, church, friends, and culture. What was most remarkable for me in this reading experience, was how much the story made me think about my own family. On the surface, this seems crazy. My family was Norwegian and Russian, middle class, college educated. But the brilliance of The Distance Between Us is its ability to ask us to think about the people who came before us — what they may have left behind to bring us to the moment we are at. I found myself weeping for my deeply depressed father, who lost his job at 50 and for my terrified, traumatized mother who couldn’t sleep for weeks before any kind of change: when her office brought in electric typewriters, and later computers. I thought about my Norwegian aunts and their small houses and how they could fix anything, cook anything, and also perm your hair. And I thought of my Russian grandmother who had affairs with at least two men while she was married to my grandfather before deciding — after all — that her husband was the one she liked best. Reading Grande’s book I really miss my ancestors. And I appreciate how missing them is a mark of respect that in no way simplifies how hard our lives may have been with them. And I certainly am awed by Grande herself, and especially her older sister, who emerges as a truly heroic figure in this incredible story. Mago is an unstoppable force in the narrative, reminding us that the people who hold us together may not be the expected ones, but as long as we have them, we will survive — more or less — intact. The book makes an urgent plea for rethinking US immigration policies and reminds us of the obverse of the usual thinking: the political is personal. Always.